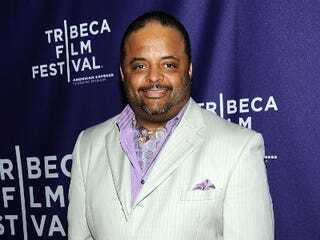 The National Association of Black Journalists reacted in a measured way late Wednesday night to CNN's decision to suspend Roland Martin's presence on its news broadcasts following complaints that remarks he made via his Twitter feed on Super Bowl Sunday were homophobic. "This is a teachable moment for all journalists," said the statement, released in the name of NABJ President Gregory H. Lee Jr. "We are reminded that what we communicate in print and broadcast — and now through social media — has considerable power. NABJ does not support any commentary in any medium that is insensitive or offensive. "Mr. Martin is one of our most committed members. In lieu of his presence on CNN, until this matter is resolved, we encourage the network to continue to present a diverse offering of voices in its programming," the statement concluded. Just last summer the NABJ had sent an open letter to CNN calling for greater diversity in its prime-time news lineup. Now NABJ is in the position of where it might have to condone having one fewer black voice on the network in order to show that it doesn't condone intolerance against the LGBT (lesbian, gay, bisexual and transgender) community. Perhaps it won't come to that. After some initial fits and starts, Martin has fully apologized for his remarks. "I'm disheartened that my words would embolden prejudice," he said Monday night, before CNN's decision. "I fully understand how a group who has been unfairly treated would be offended by such comments, and, again, I am sorry for any offense my remarks caused." The Gay and Lesbian Alliance Against Defamation's reaction to CNN's decision could be seen as an olive branch: "We look forward to hearing from CNN and Roland Martin to discuss how we can work together as allies and achieve our common goal of reducing such violence as well as the language that contributes to it." Before these groups are tough choices that remind all of us in media that with the power of our words — every single one of them — comes responsibility, no matter which medium you use to express yourself.